First recharge for 98rps gprs plan. after that activate 3g by sending sms 3g to 121. First u hve 2 use 2g speed gprs plan for sometime. 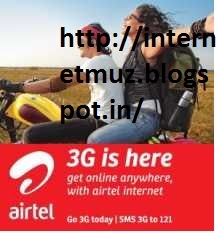 For atleast 30 to 50 mb..After nly u will get 3g speed.. Idea offers a range of Postpaid plans to suit your needs. Choose talk time offers, 2.75G service, Special Tariff Vouchers and plans.